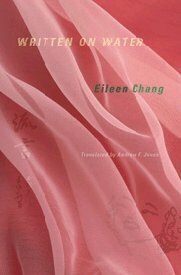 After reading a couple of Eileen Chang novels and short story collections, I wanted to learn more about this intriguing author. So last week I headed to my public library and checked out her collection of essays, Written on Water (Columbia University Press, 2007). Chang wrote these essays in her early 20s after fleeing Hong Kong for Shanghai at the beginning of WWII. They cover a wide range of topics from Chinese opera to western art to fashion and her relationships with her father, mother, and step-mother. I especially loved reading her vivid descriptions of Hong Kong and Shanghai during this time. Growing up with a gambling- and opium-addicted father and a mother who whisked away to Europe for a few years at a time, Chang longed to escape to the UK for her university studies. But by the time she graduated high school, WWII had broken out in Europe and going abroad was no longer an option. So she enrolled at Hong Kong University. I’m glad I read Written on Water after Love in Fallen City and The Rice Sprout Song. I can now see where she used snippets of her life (people she knew, places she lived, events she experienced) in her fiction. Interspersed throughout these essays are illustrations Chang drew during the early 1940s. For the novice Chang reader, I would suggest leaving Written on Water for after Love in a Fallen City or her other work originally published before 1949. Thanks so much for your comment!! I loved reading your blog (http://glasshospital.com/ for those reading this comment) entries about China. What a great experience, especially for the kids! Thanks for this link. I hadn’t seen it. It’s quite amazing to think that families in China can afford $27,000 a year in tuition. Less than 20 years ago, that might have been as much as well-off folks there made in a lifetime. Times they are a changing.